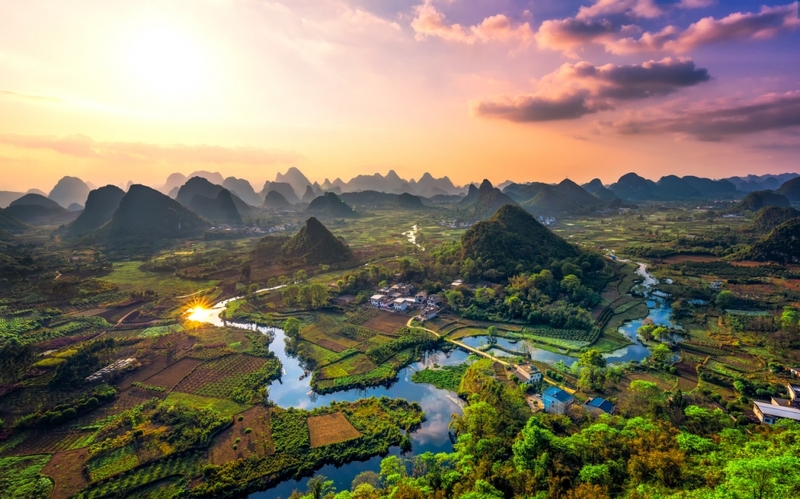 China has incredible variety of landscapes, but probably the most recognizable and most known landmarks are Huangshan, Guilin and Zhangjiajie. And it’s easy to understand why! 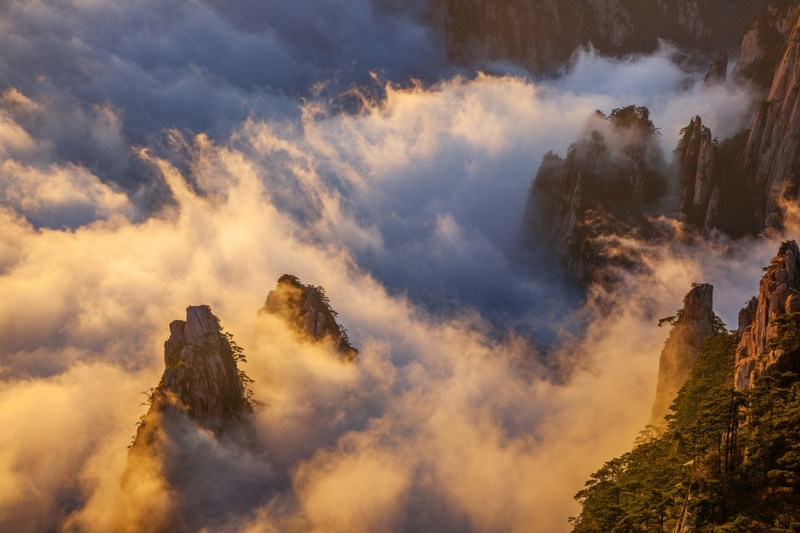 Huangshan is the “Yellow Mountain” area with fantastic granite peaks piercing the sea of clouds with pine trees on top. 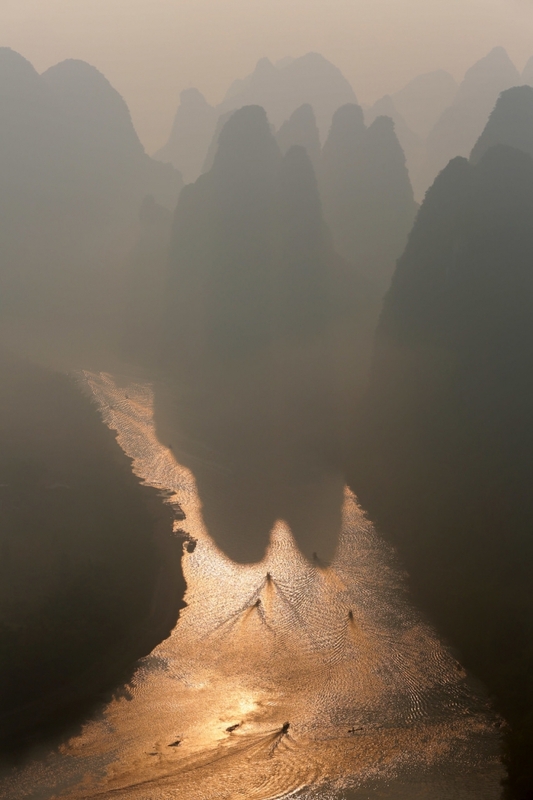 This place seems to be just like a Chinese painting. 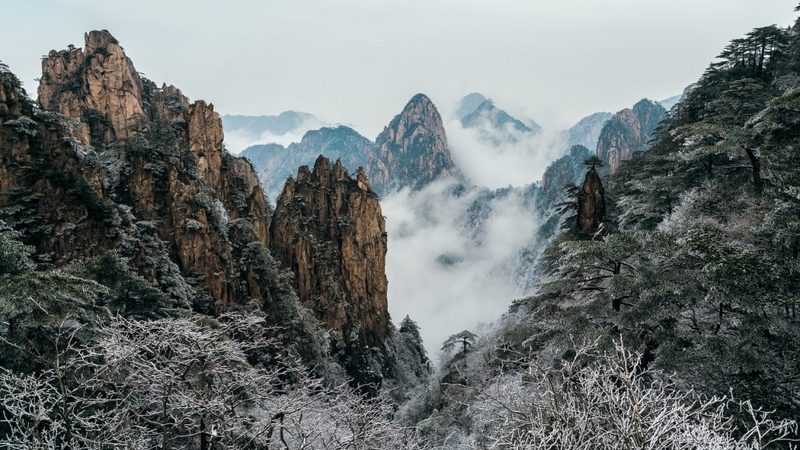 We visit Huangshan in a very special season: winter. 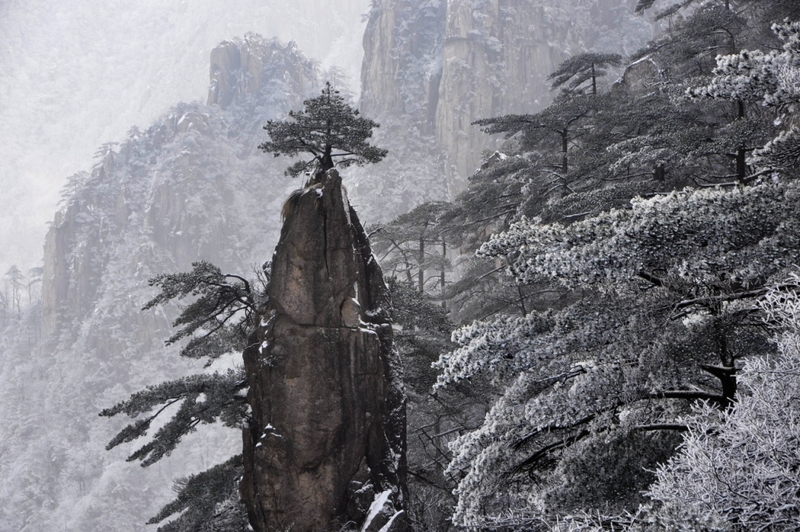 Let’s bring some luck with us to see this stunning landscapes covered by snow and frost! That’s the reason to go in January. 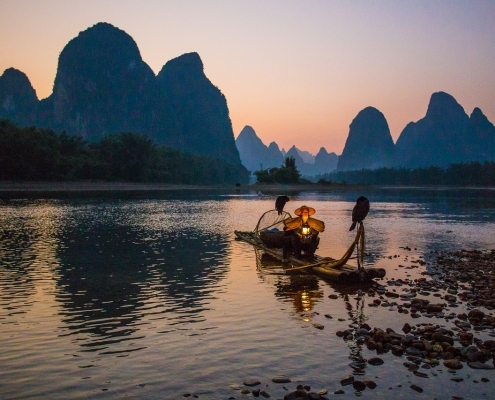 Guilin is another magical place, very special karst landscape with soft tall mountains reflecting in Li river… Although you can’t see snow in January, it is a quiet season to visit Guilin. Less crowds is always better for photography. 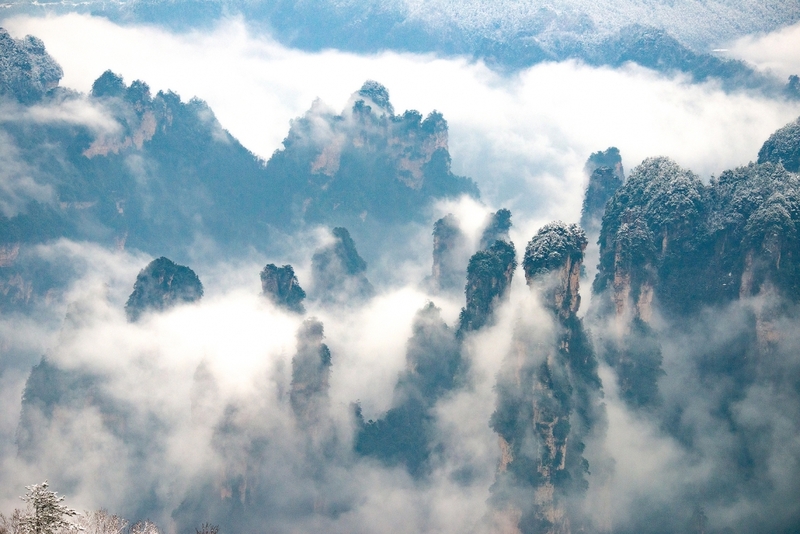 Zhangjiajie is UNESCO world heritage site which inspired James Cameron to create “Avatar” movie landscapes. Sharp rocks piercing the sky with infinite rhythms till horizon. This time of the year it’s a great chance to see snow on these peaks. To ensure we get special conditions we spend enough time in each location. Without rush we explore far corners of each park in winter. Our journey starts and finishes in Shanghai. We booked one night 15-16 January at hotel for you. Although the tour starts tomorrow, you can have some rest after the flight. It’s recommended to arrive a day or two earlier. Hotel is included in tour price. Your names will be at reception desk. Transportation to hotel is not included. We meet at 6:00 am at hotel reception altogether. You should be ready for departure at this time. We have a transfer booked to train station. At Shanghai Hongqiao High-speed Railway Station we take the G1509 high-speed train, and arrive at Huangshan North Station at 13:30 in the afternoon. 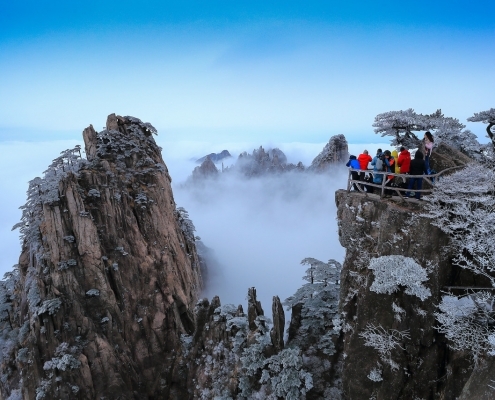 Upon arrival we take the ropeway up the mountain, pass Zhixin Peak, Mengbi Shenghua Mountain Peak. 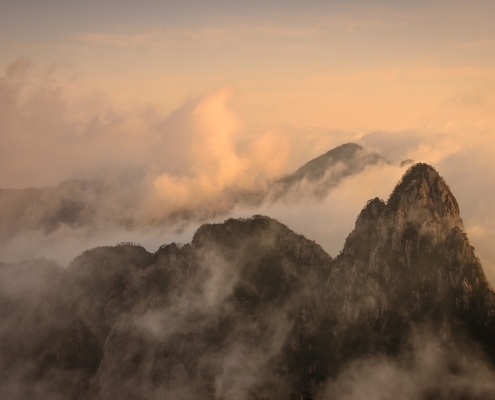 We check in to Huangshan Hotel, sort out equipment and leaving for sunset location – Paiyun Pavilion. Early wake up. 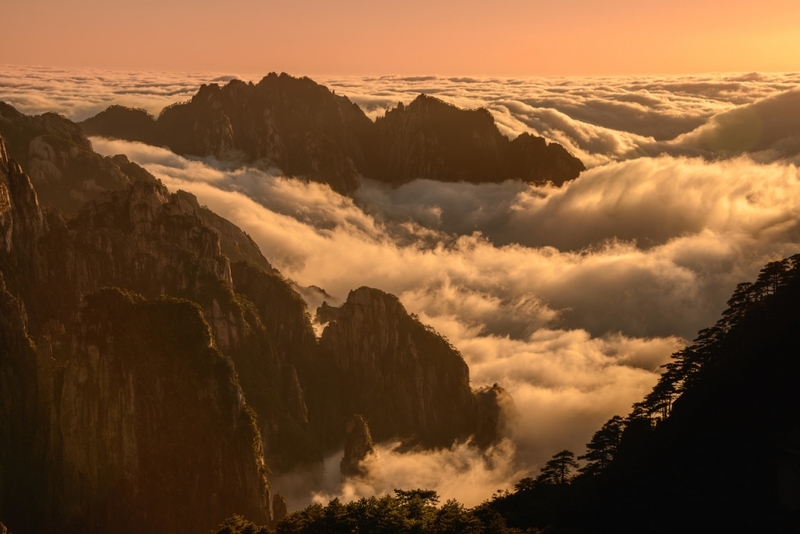 In January it’s still not that bad, but we walk early to stunning locations – “Lion Peak” or “Shixin Peak” to meet sunrise. The final choice will depend on current conditions. After sunrise we return to the hotel for breakfast. Morning exploration of the North Sea area. Return to hotel for lunch. In the afternoon we arrive at “Bright Peak” location. We take photos at “flying stone” at sunset and later return to hotel for dinner. Early wake up again! 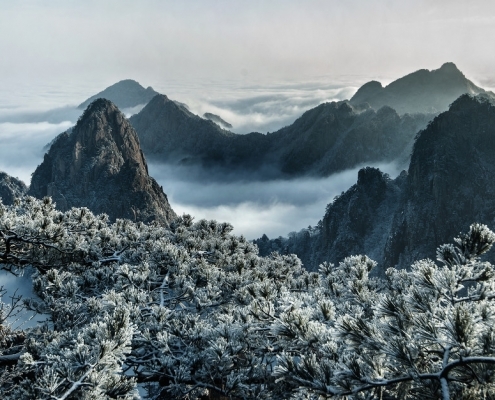 We choose “Lion Peak” or “Shixin Peak” for sunrise depending on snow/fog conditions. Return to hotel for breakfast. After breakfast we have time to pack our bags and check out from hotel. We are moving to the other side of the park. 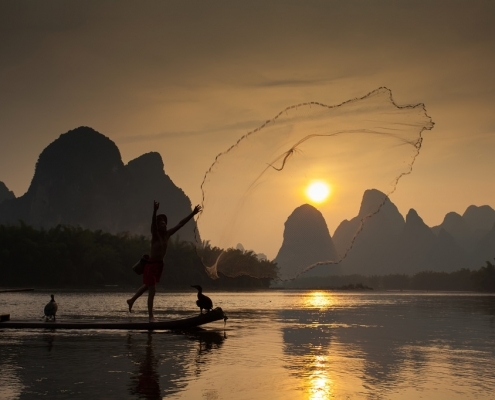 We will arrive at Guang Ming Ding and stay at Baiyun Hotel. In the afternoon we leave hotel to explore Baiyun Scenic Area. Return back to hotel after sunset. 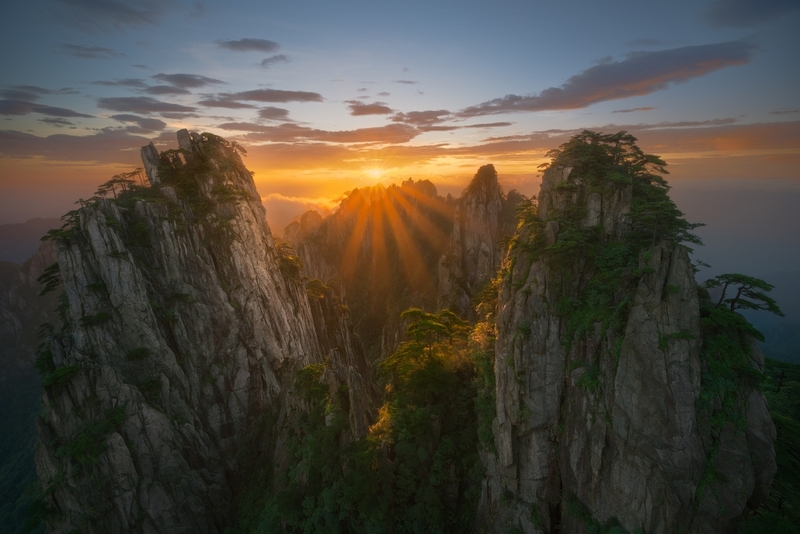 In the early morning we leave to photograph sunrise at the “Bright Summit”. 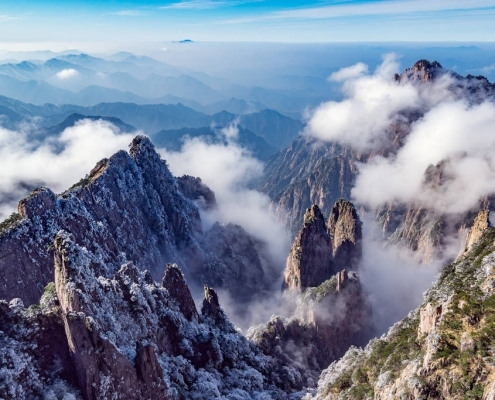 Let’s hope for sea of clouds below and snowy peaks with pine trees in “Chinese painting” style. In the afternoon we will take photos at beautiful locations: “Welcome to the Pine Tree” and “Three Musketeers”. Stay at the same Baiyun Hotel and enjoy lunch and dinner at the hotel. 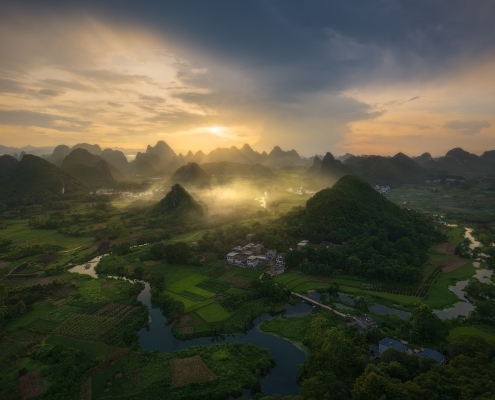 Before sunrise we walk to the top of the hill above Li river and enjoy the magnificent view to classical karst landscape. 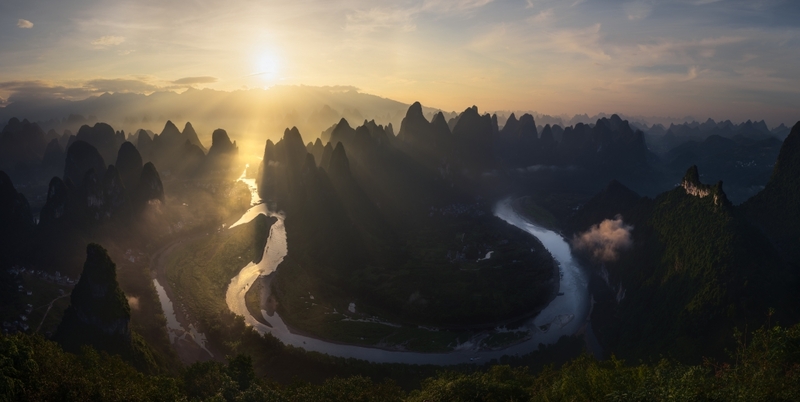 Wonderful panorama of soft hills and river bends will open to our eyes. Next 3 days we pick up best panoramic locations in the area. 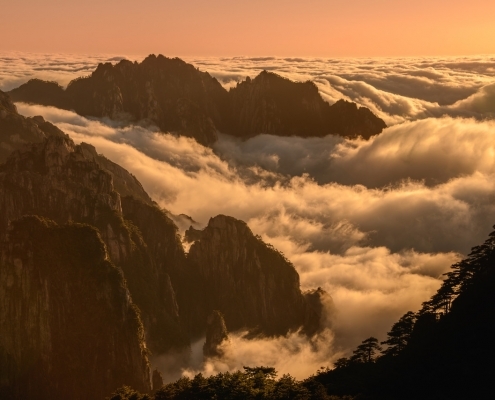 Sunrise will be optional today – depending on the group condition. 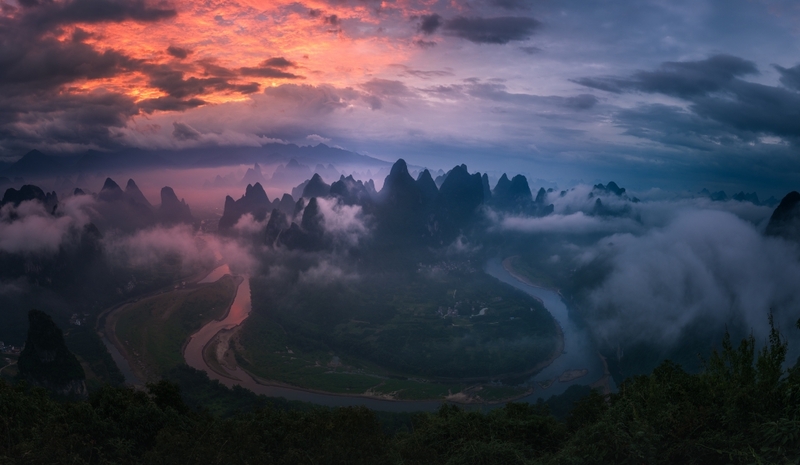 Today we take a high-speed train and arrive at Zhangjiajie in the evening. 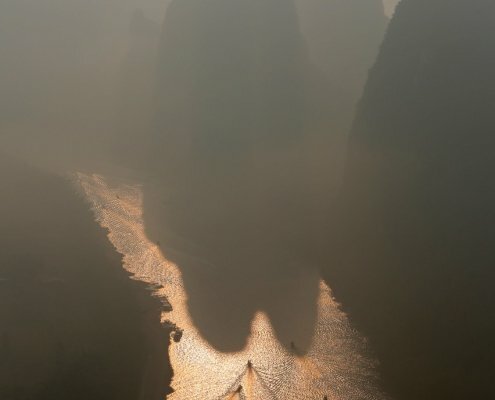 We devote this day to Tianmen Mountain in Zhangjiajie. 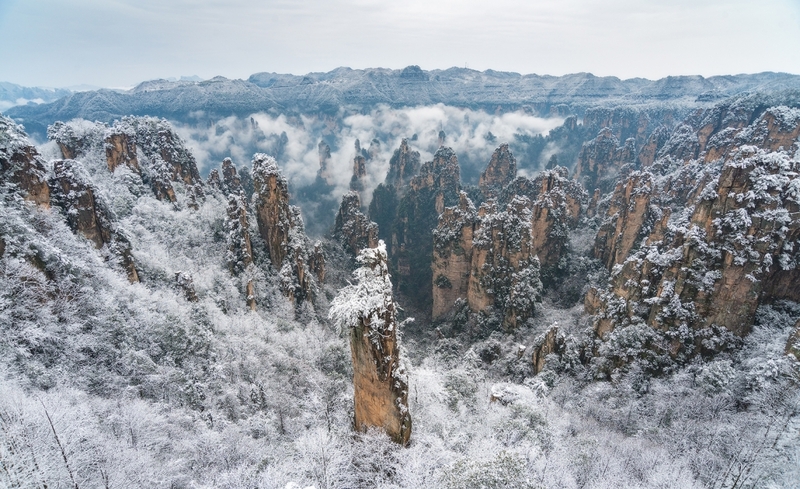 Zhangjiajie is the “World Geological Park” located in the northwestern part of Hunan Province. 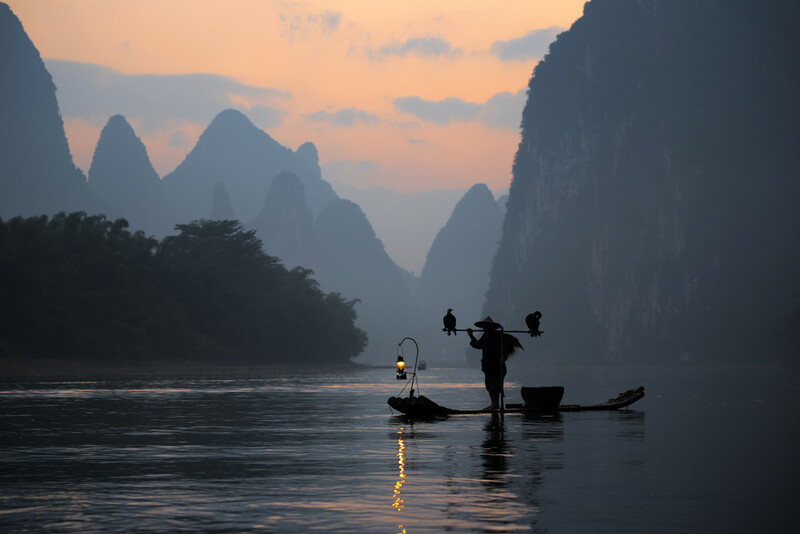 It is known as “The Original Manuscript of Chinese Landscape Painting”. 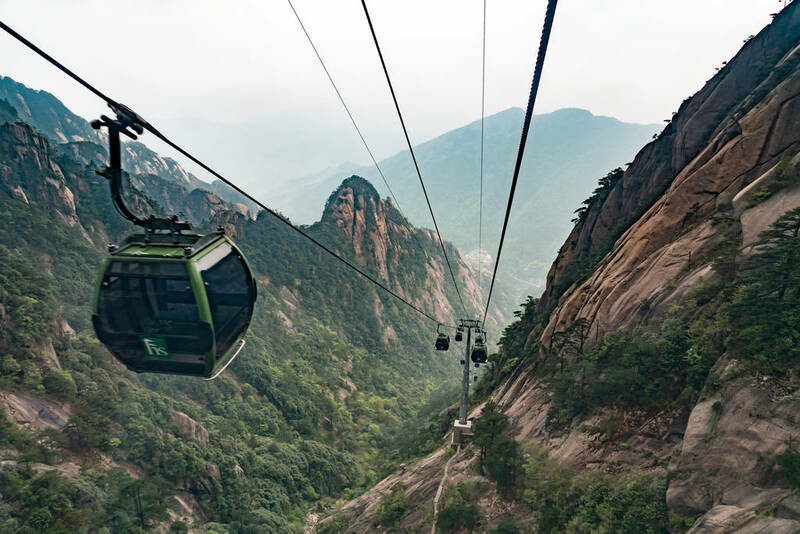 We will experience the longest cableway in Asia with a length of 7200 meters! After we reach the mountain we take photos of “Avenue to Heaven”. 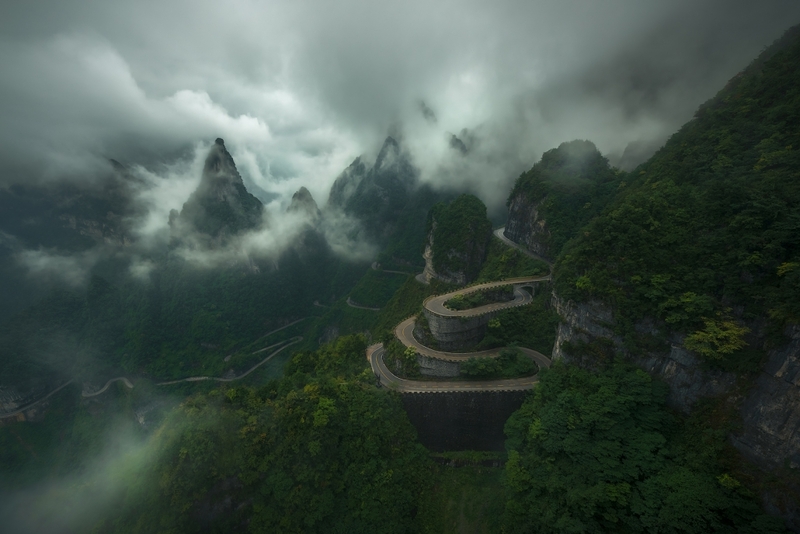 On the top of Tianmen Mountain we will experience the Cliff-Hanging Walkway; hold your breath and experience the thrilling Glass Sky Walk. 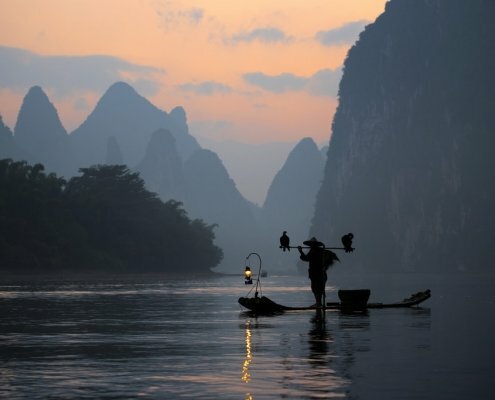 Today we also visit Tianmen Karst Cave. 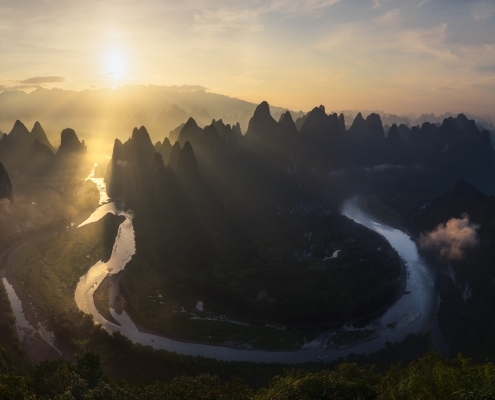 Today we capture the most beautiful scenery in Zhangjiajie National Forest Park. 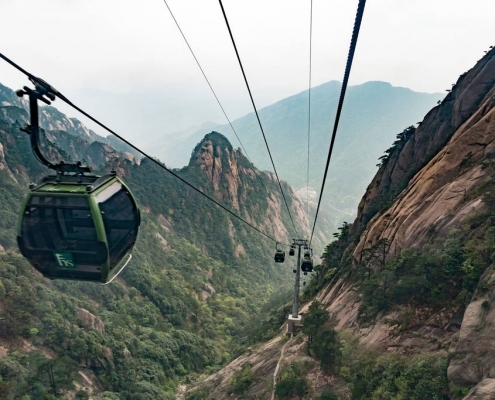 But first we take cable car to Huangshi Village, which is 1080m above the sea level. 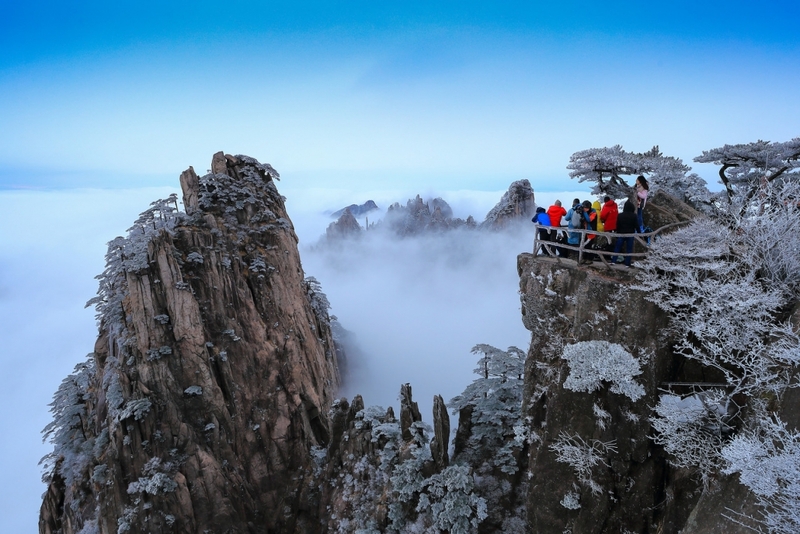 It is the biggest sightseeing platform with numerous lookout points for stunning views. 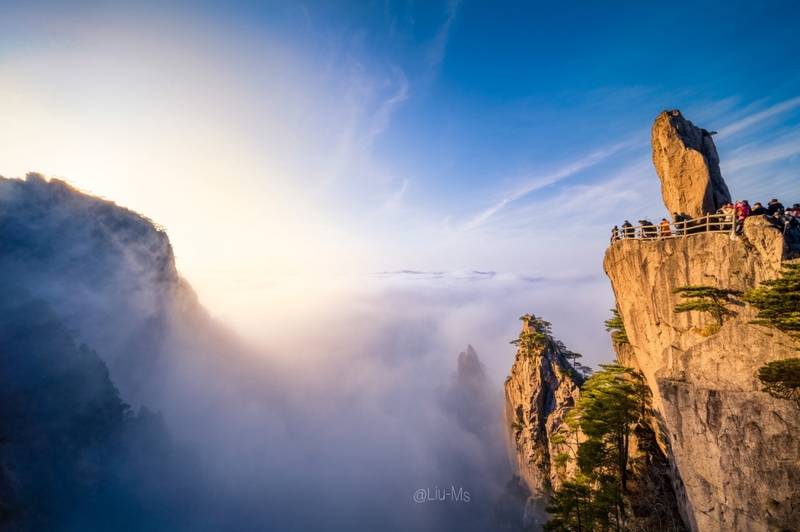 From this spot you can see nearly half of the odd-shaped pillars of Zhangjiajie. 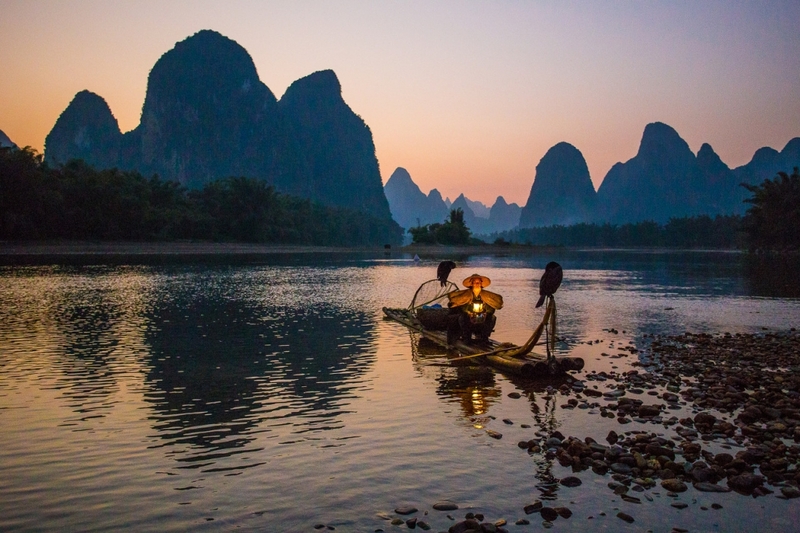 A local proverb says “The person who does not reach Huangshi Village does not pay a true visit to Zhangjiaije”. In the morning we’ll take Bailong elevator up to explore the Real “Pandora World” – Yuanjiajie. 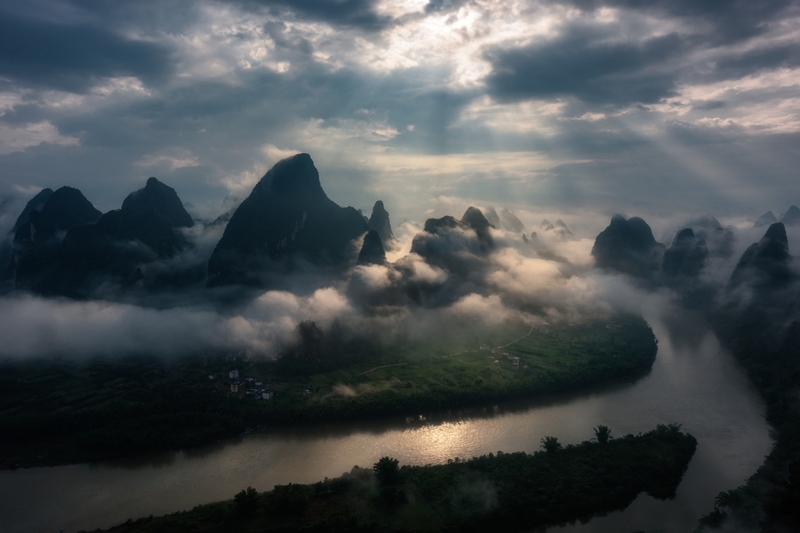 Yuanjiajie is world famous as it was inspiration to create floating mountains in movie Avatar. 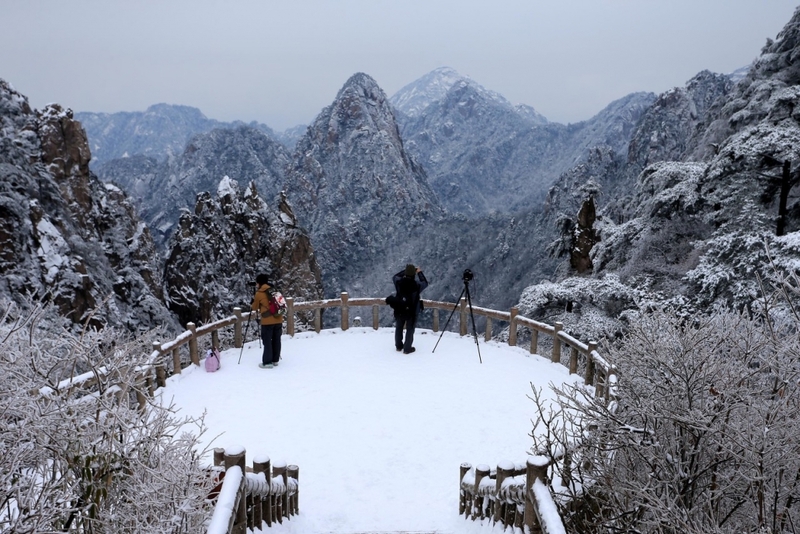 We take sightseeing bus to the lower cable station of Yangjiajie and take cable car up to another locations. 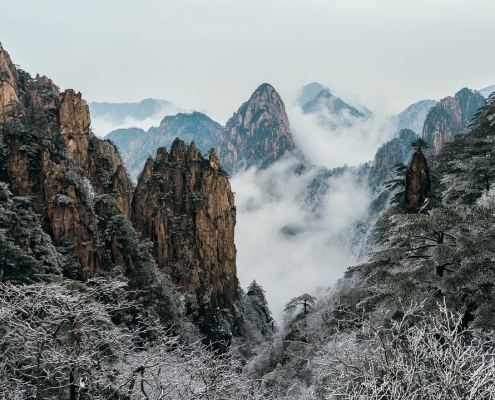 Yangjiajie is a relatively newer part of the Zhangjiajie National Forest Park and it’s as beautiful as Yuanjiajie and Tianzi Mountian. 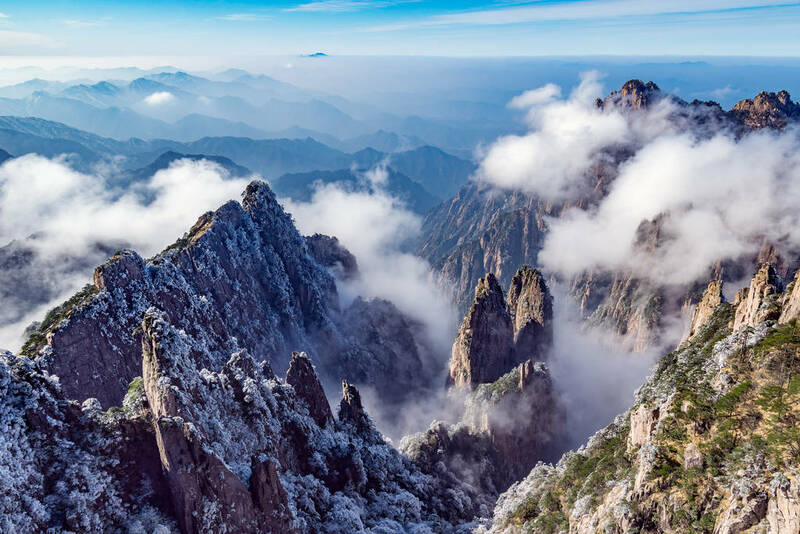 Photograph main attractions such as Tianbo Mansion, Oolong Village, Natural Great Wall, Corridor with Cliffs, and capture sunset in one of these locations. 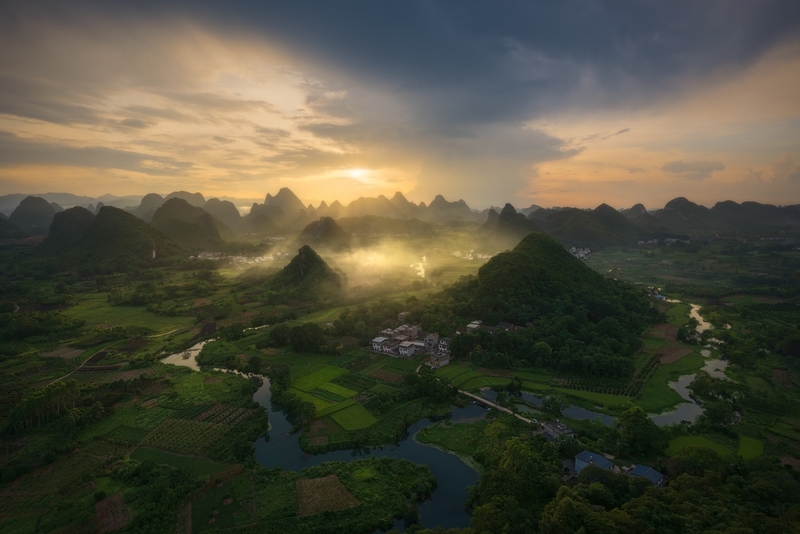 In the early morning we are heading to Laowuchang, which is a perfect place for sunrise photography over mountains and fields. 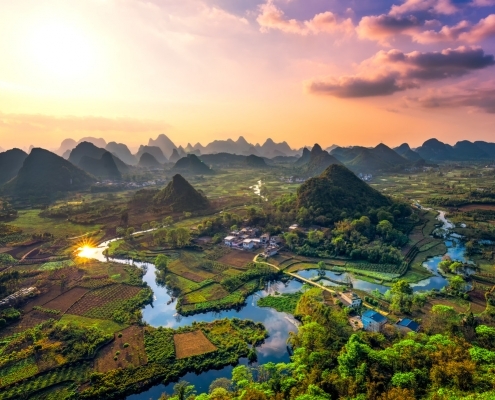 Photograph the most interesting sight – “Fields in the Sky”, terraced rice paddies on the top of the peaks. 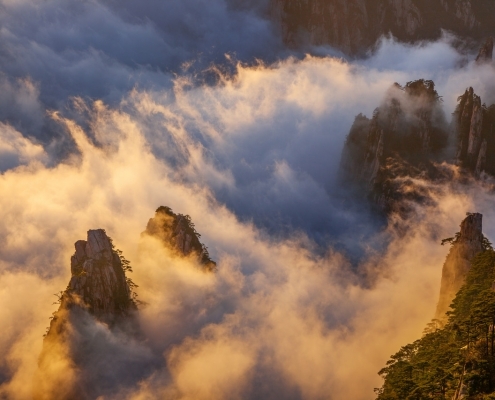 On this day we visit Tianzi Mountain. 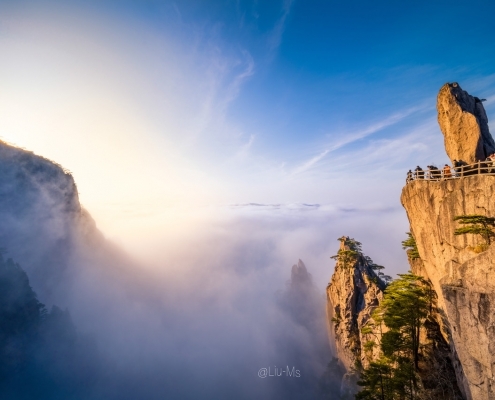 We enjoy stunning view of the peaks rising one after another. Atop of the mountain we’ll photograph amazing panorama of “Rocks in the air”. 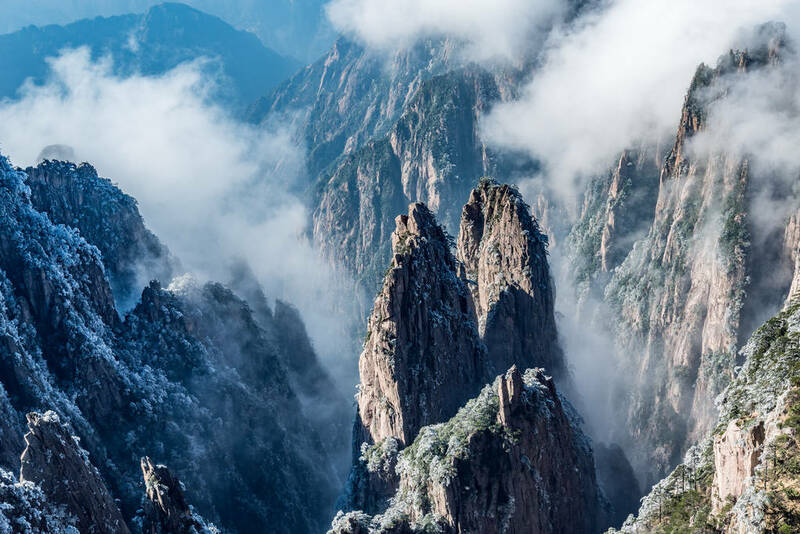 There are four wonders in Tianzi Mountain: the Sea of Clouds, the Radiance of the Moonlight, Rays of Sunshine and the Snow in winter. 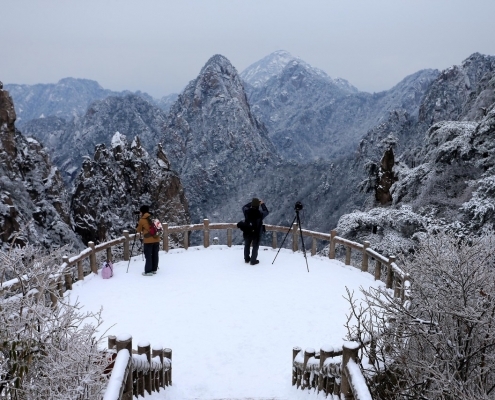 Let’s hope we also get snow as a big bonus to already magnificent landscape. 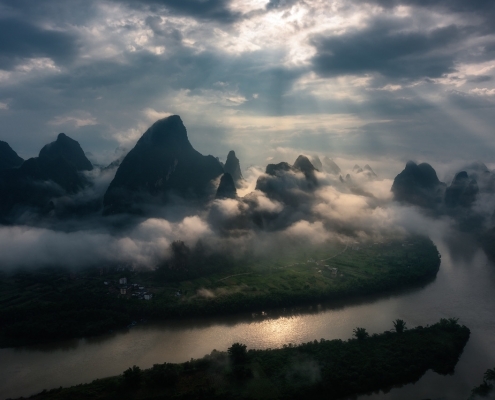 We choose sunrise location depending on the weather conditions. After check out from our hotel we take the Bailong Elevator down to the station. 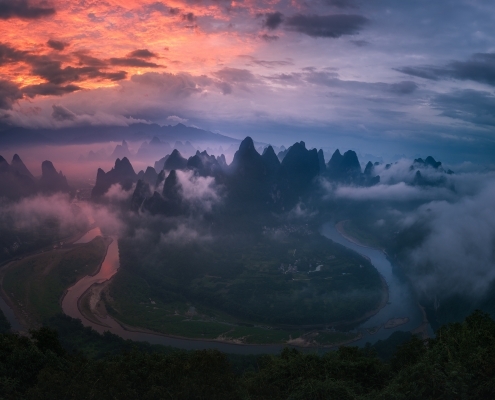 Take the eco-car to the scenic gate and after dinner, drive to the Zhangjiajie Hehua Airport. 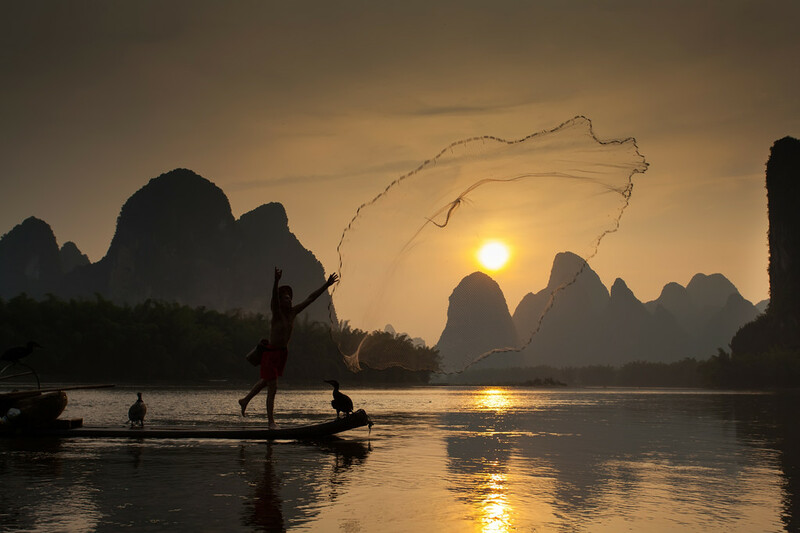 We catch a direct flight to Shanghai, and finish the Chinese landscape photography trip at Shanghai airport – our flight arrives at 9 p.m. We say farewell each other at Shanghai airport PVG. – A telephoto zoom lens, such as a 70-200 mm + 80-400 or 200-500. Canon – 100-400. 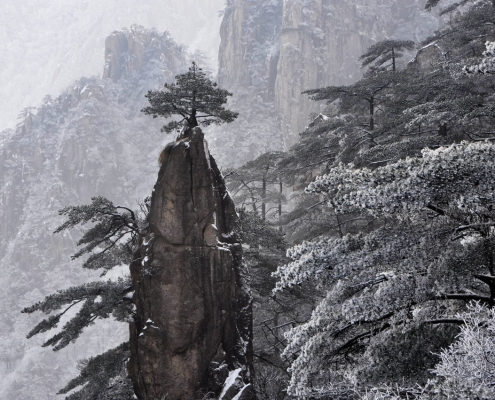 One of the most important lenses in Huangshan to photograph lonely pine trees. Be sure to have additional tripod mount to this lens. 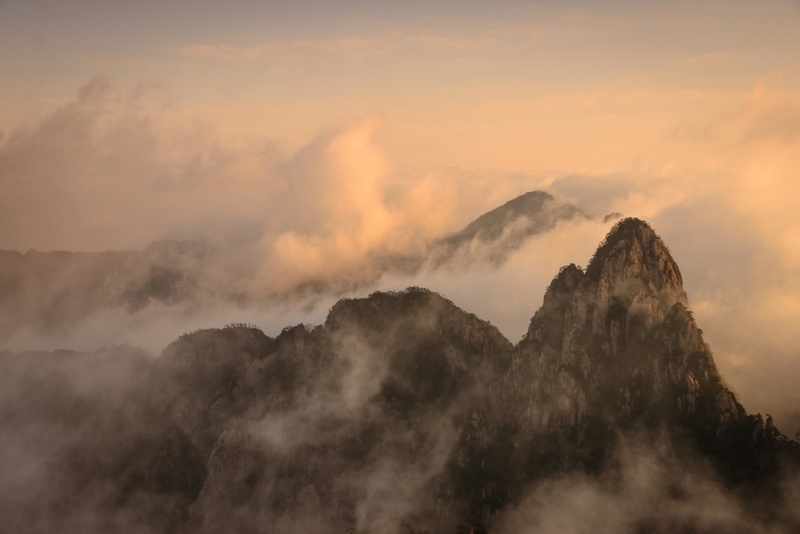 Please note that difficulty level is moderate, just because we need to walk stairs at Huangshan. We will be exploring the park for 4 days walking to sunset and sunrise. With possible icy conditions you need simple interchangeable crampons. Please note that some cable cars might be closed due to heavy snow – so will adapt to weather conditions. 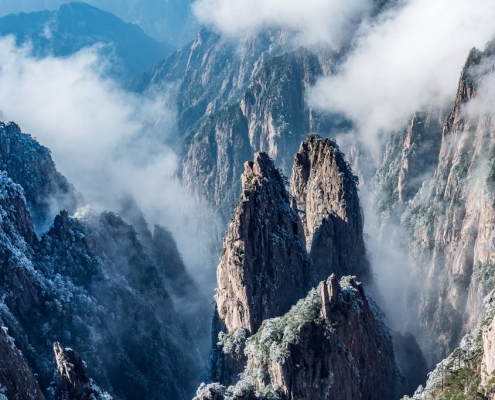 If we lucky enough we might see snow on mountains, but rainy conditions are also possible.